I have a small kitchen...and it's driving me insane. It's so small in fact, that I have to store many of my kitchen items in very random places. For example, my rice cooker, croc pot, and cake decorating supplies are hidden in a little cabinet in my living room. I also have kitchen items in my coat closet and hallway niche. It would really be so nice if my husband and I could do a little kitchen remodel, but seeing as we are currently in a rental (and couldn't afford any big changes anyways) I have been looking for some great kitchen storage inspiration. I came across so many great ideas during my search, but many of them were ideas that could not be easily removed, and seeing how we are renting and don't know how long until we move, I needed storage ideas that I could take with me or were inexpensive fixes. 1. Labeling - no matter how small the space, things always stay more neat and tidy when they have a designated home. Labeling can help you and your family stay more organized. 2. Hanging Storage - Get things off of the counter and hang them on the wall, especially your more appealing pots, pans, and kitchen utensils. This not only gives you more work space, it also makes it easier to grab items that you use frequently. 3. Unexpected storage - Use the inside of cabinets and doors to your advantage. Peg boards are a great inexpensive solution for added storage. 4. Removable furniture - If you can't change your existing kitchen, bring in an armoire to give you extra storage space. Plus this is an investment that you can take with you and can serve various storage needs. 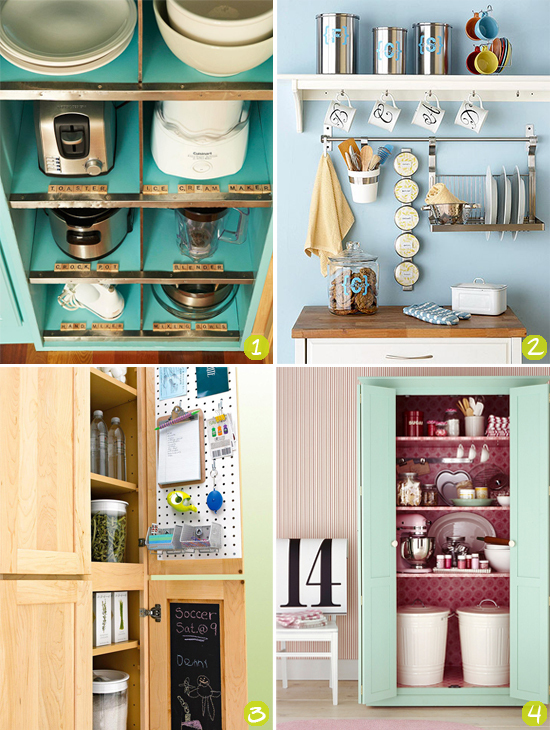 Do you have any tricks you use in your own kitchen to save space? Photo Credit: Photos 1-4 are credited to bhg. ps, peg boards are my favorite, that's my vote! That is about the size of my kitchen! We use a a microwave cart as our only counter space, its nice because you can move it, its the only way to be able to get to everything. 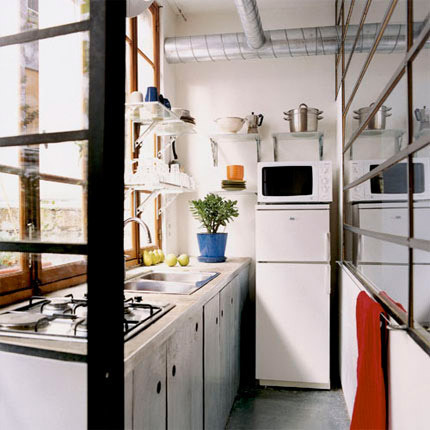 I love the idea of using the walls as storage space. I find that if I have clutter free counters I am much more happy! I love the clever labeling. I'm like you in storing/shoving in other random closets cuz I HATE having things on the counter. One of my biggest pet peeves. LOVE the scrabble tile shelf labels! My kitchen isn't very small but I find myself storing crock pots and other larger items in my living room closet too! I think you max out whatever space you have, no matter how small!